Whether you’re an avid birder or a backyard bird watcher, Bird Watcher’s Digest has something for you. Each issue is like a mini-bird-watching book. BWD’s convenient field-guide size makes it easy to take with you anywhere or store on a bookshelf for quick reference. 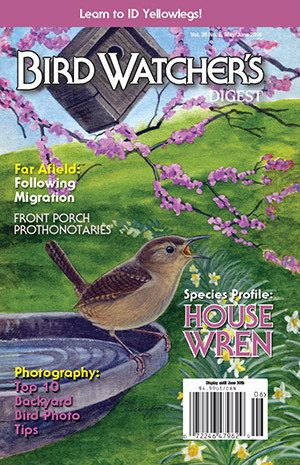 Bird Watcher’s Digest is a bimonthly (six issues a year), digest-sized magazine. Each issue of BWD reaches more than 125,000 people worldwide. Each issue of BWD comprises a wide array of material aimed at bird watchers and birders at all levels of interest and ability. Each issue of BWD comprises a wide array of material aimed at bird watchers and birders at all levels of interest and ability. Regular columns and features for which freelance submissions are considered are listed at the URL listed below. BWD is always looking for well-written accounts covering backyard birds, including feeding, housing, bird gardening, how-to projects, and interesting bird behavior and experiences. They also publish general feature articles covering a wide array of topics of interest to today’s bird watcher. Articles that touch on a unique/unusual topic, humorous articles, and authoritative advice-type articles often find a place among our pages. Up to $300 per article. The magazine encourages and prefers queries and manuscript submissions via email. Send them to submissions@birdwatchersdigest.com with the subject line “Submission – (your topic).” Use the body of the message as a cover letter, and attach your manuscript in MS Word or rich text format.